This month is light on new releases thus far, so we'll have to make due with another retro review. 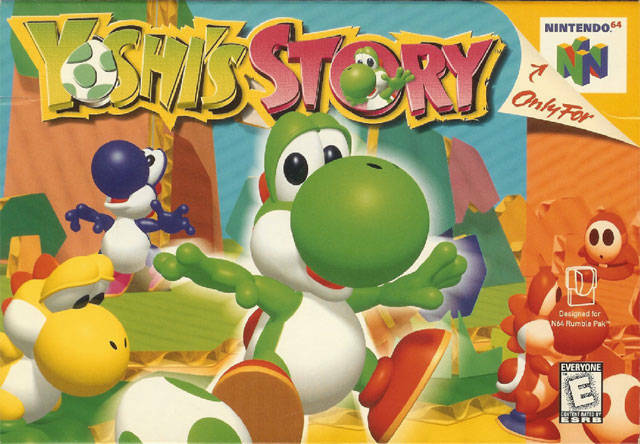 It's the colorful and fun storybook classic, Yoshi's Story for the Nintendo 64. Let's take this one off the shelf and start reading, eh? Shigeru Miyamoto is one of the most acclaimed, if not the most, game directors in the video game industry's history. However, even he isn't above making a misstep here and there. Enter Yoshi's Story. While a grand idea on paper, the execution isn't necessarily a storybook ending. Six baby Yoshis awake from their slumber with their island caught in the middle of chaos. Baby Bowser intends to be on Santa's naughty list for yet another year in a row by stealing the Yoshis' Super Happy Tree and flattening their world into a pop-up book. The plot may be grim, but the Yoshis are adamant on retrieving their tree and shelving Baby Bowser for good. 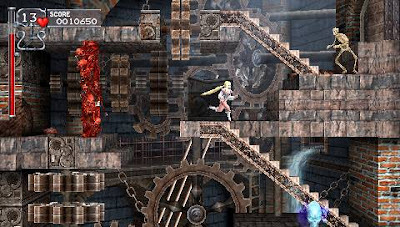 While there are twenty-four different levels, only six can be played during a given playthrough. Depending on which path you embark on, the story changes until the obvious and given conclusion of Baby Bowser's defeat. And so the Yoshis' journey begins. As stated there are indeed twenty-four levels to explore, but you won't be able to access all of them in one runthrough of the game. Instead, there are six chapters to the tale of the Yoshis, and each chapter has four levels. You select one of the levels to play through, and after that level is completed, you move onto the next chapter. Depending on how many hulking happy hearts you collect, there's three in each level, you open up new levels to choose from. So if you don't collect any of these giant hearts in a level, you'll have access to only one level in the next chapter. If you collect all three, the next chapter will have all four levels open to choose from. But you still only get to play one level in each chapter. The fruit eaten will show up as a frame around the game. Yoshi's Story doesn't play as your standard, typical 2D platformer. There is no running to the stage exit. Instead, you complete a level by gobbling up thirty fruit of any variety. Once thirty fruit have been consumed, you check out of the level and move on with your journey. There's several types of fruit, but by far the most valuable fruit are the melons which there are exactly thirty of in each level. By eating fruit of the same variety in a row, your point score multiplies. Since melons are the most abundant fruit in a level, it's imperative to eat as many melons as you can find to get the highest score in a level. 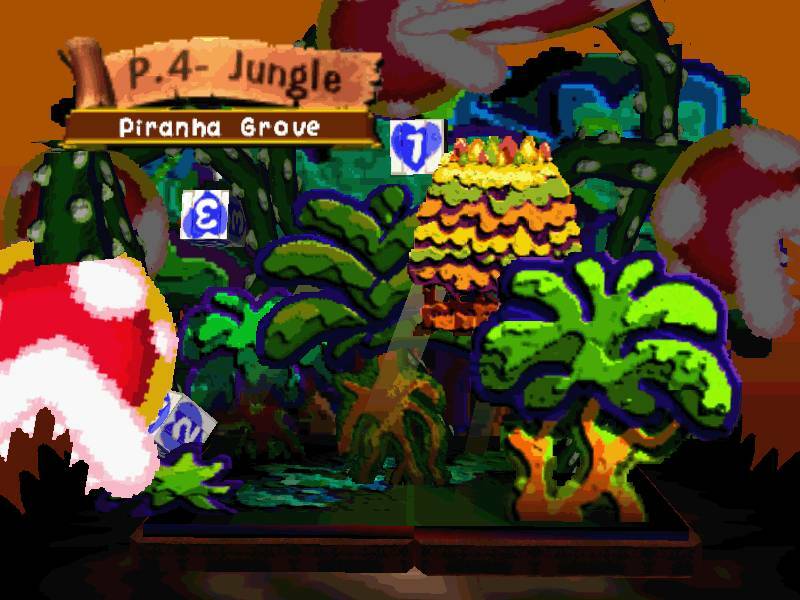 At the start of the game, you randomly choose a favorite fruit for your team of Yoshis. This fruit, either grapes, bananas, apples, or watermelons, will refill your Yoshi's health completely when eaten. It's their lucky fruit. Still though, for the best tally of points, melons are the way to go. 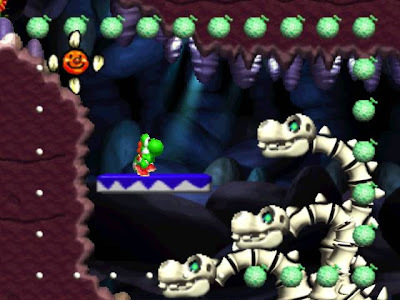 Yoshi has a bone to pick with these dragons! And these melons aren't easy to obtain either. At least not all of them. 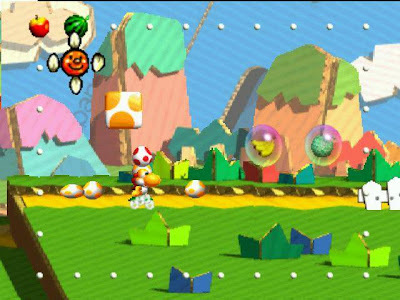 They're hidden in the ground, inside poles that need to be ground pounded, mini-games that need to be won such as running to a marked goal with a stack of melons that your Yoshi has to careful balance, and inside one-chance prize bubbles. Usually it's just easier to eat up thirty random fruit and breeze through a level, but again, if points are important to you, then you'll want to search and gobble up all that you can. It'd be nice if there were point scores to beat that would unlock hidden content, but gathering and gobbling melons is just for show and nothing more. So what's the point really then? Controlling Yoshi is very similar to how he plays in Yoshi's Island. The difference is when Yoshi gets hit, he doesn't lose a screaming toddler. Instead, he loses some health which can be restored by eating some fruit or an unsuspecting enemy. When a Yoshi fails, depletes his health to zero, or falls into a pit, Baby Bowser's minions grab Yoshi and capture him. Then you have to choose a different colored Yoshi (up to seven others) to continue the last Yoshi's work. Though the game isn't entirely on the challenging side, really, so you should be able to keep most of your Yoshis intact. This tower is something out of Vertigo. Yoshi is a very agile little fellow with plenty of moves in his arsenal. The most noteworthy feature of Yoshi is his ability to chow down foes and poop up eggs. These eggs can be used as weapons, targeted at enemies, and then thrown. You have much more room to maneuver when aiming instead of the fixed up and down targeting of Yoshi's Island. It's much simpler to aim eggs at enemies in Yoshi's Story. The multicolored dinosaurs also can flutter-jump. That is, jump and then hover for a brief period of time. Then there's the Mario-patented ground pound, perfect for smashing open crates and stomping down wooden planks. In all, Yoshi controls a bit too loosely for my liking, but other than that, the game controls nicely. As aforementioned, there's six chapters in total. Each chapter has its own theme from jungles to lava caverns to oceans to Baby Bowser's castle. Each chapters also has four levels to choose from numbered from 1-4. The higher the number, the more challenging the level is going to be. 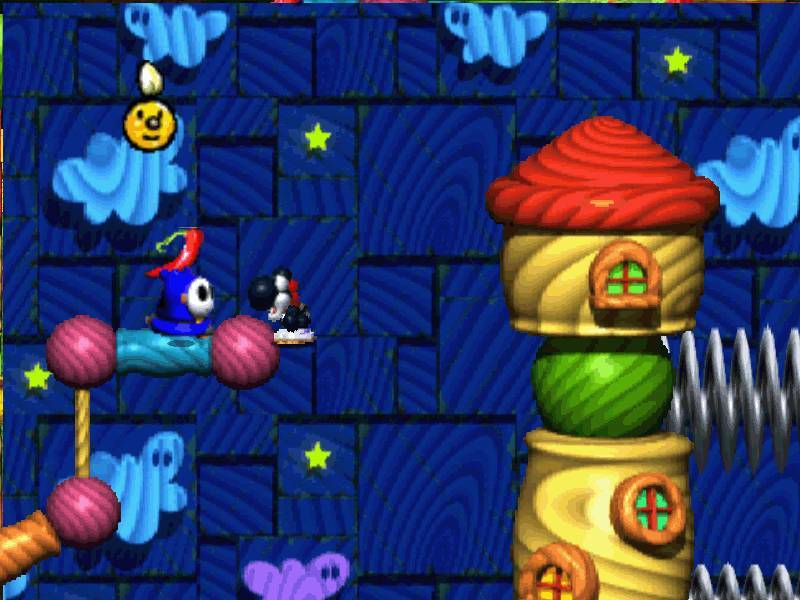 Levels are full of gimmicks, challenges, and enemies both new and familiar to fans of Yoshi's Island including those lovable shy guys. Levels are pretty long and have four warp points each to help get around levels more quickly. The Yoshis will definitely need them as it's easy to miss melons or any other desired fruit to clear a level fast. One level will put you inside a flooding maze where it's easy to get lost searching for delicious yummy delights, while another will have you running from shy guy ships in the distance blasting cannonballs at you. In short, there's a lot of variety in the levels, and it's worth playing through the game multiple times to see them all. 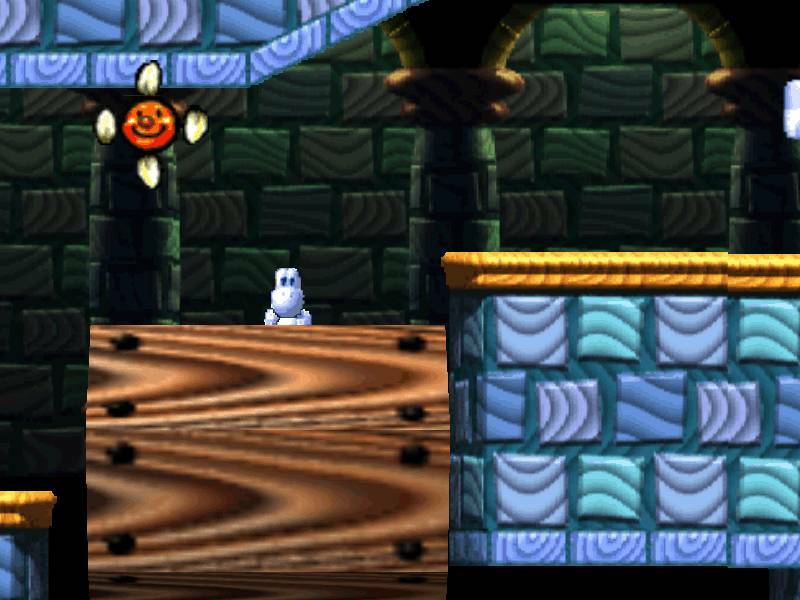 Tricks not treats abound in Baby Bowser's castle. Yoshi's Story isn't a terribly long game. Even so, you can save and continue after every chapter and pick up your progress from there. The story mode itself will take most players but a handful of hours to complete. This is where things get tricky. If you're an old-school gamer, you're much more likely to try out getting top scores, scouring every level for melons. Everyone else may see no reason to do such a thing, and they wouldn't necessarily be wrong. With no incentive besides high scores to collect, there's nothing to gain from gathering all the melons in each level. Visually, Yoshi's Story is one of the more impressive 2D platformers on the Nintendo 64. Everything from the denim jean backgrounds to the cardboard mountains and trees scream "style". The game runs at a steady clip which is always tough for a graphically-intensive N64 game such as this one. Meanwhile, the soundtrack recycles the same melodies quite often, but it's nothing that grows grating or annoying. Overall, a truly impressive presentation package for this storybook game. Level selection occurs in this pop-up book. Ultimately, Yoshi's Story is an entertaining experiment, but it's over far too soon to shell out the original fifty or sixty bucks to play through it. With the game on the Wii Virtual Console for ten bucks, there's much more to love about the game at that price. Even then, Yoshi's Story remains a rather flawed game. Pick it up if you're curious, otherwise steer clear as there's not much to this twenty-four level title. 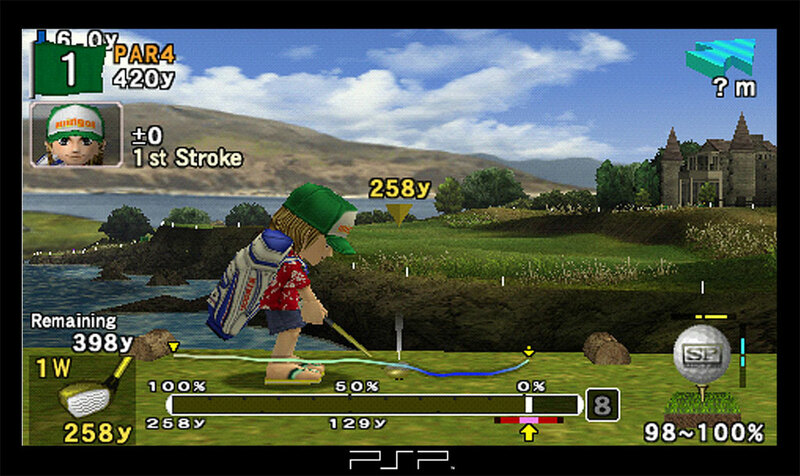 If you recall last Friday, we took a look at my favorite golf games of all time. Now I'd like to take a look at the games that didn't quite make that list. You can cram these two lists for a top ten if you'd like, they're the Top Five Other Golf Games. Let's tee off, shall we? 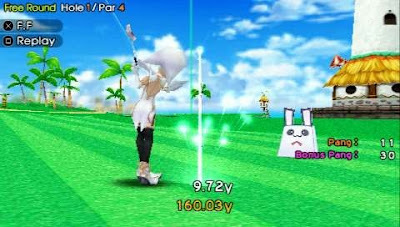 PANGYA on PC is known as Super Swing Golf on the Wii. I really enjoyed the second entry on the Wii as it had a lot of content to drive through. From the single-player story mode where you went from board space to board space like New Super Mario Bros. Wii, completing challenges and facing off against golfers in competitive play, to the multiple costumes you could unlock for your characters. While the swinging controls weren't the best and I had to opt to use a Gamecube controller, Super Swing Golf: Season Two was still a fun diversion from playing the real thing. 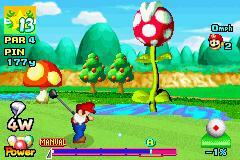 You take Mario Golf and you minimize it to fit on the Gameboy Advance's screen. Seems like a match made in heaven, and it truly was. 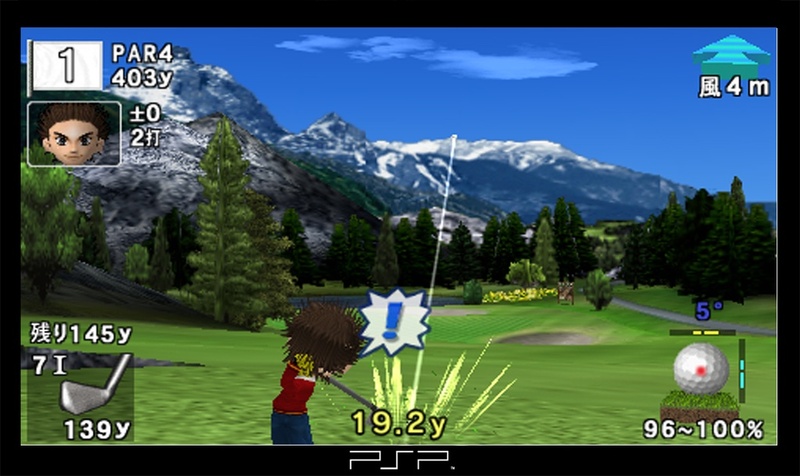 This time around the game was more of a golf game with RPG-like elements. 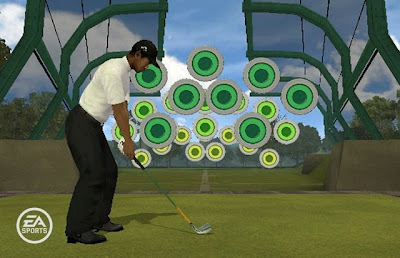 As you played the various well-designed courses, you earned experience that could be used to level up your golfer to give better accuracy, power, and spin. As you progressed your custom golfer could take on the likes of Mario, Donkey Kong, and Bowser! 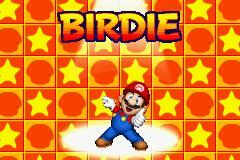 A great pocket-sized golfer, Mario Golf: Advance Tour is a terrific title. PANGYA returns on the list with even more fantasy golf fun. 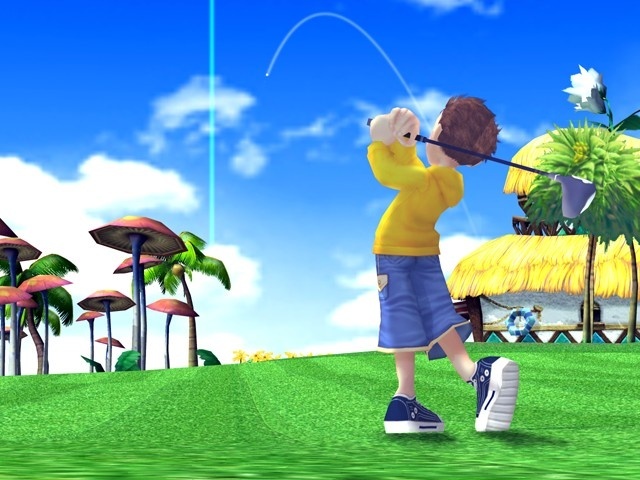 With approximately nine themed courses from tropical shores to winter wonderlands, the ability to earn new apparel and gear for your characters, and a long story mode that has you playing as every character in the game, Fantasy Golf is definitely a load of fun. It's not as if the PSP is dying for golf games, but excellent golf games like PANGYA: Fantasy Golf are welcomed additions to the PSP library. If you can find a copy cheap and like golf, there's no reason why you shouldn't check this title out. While Open Tee 2 was bigger and better than its predecessor, don't look down on the original. 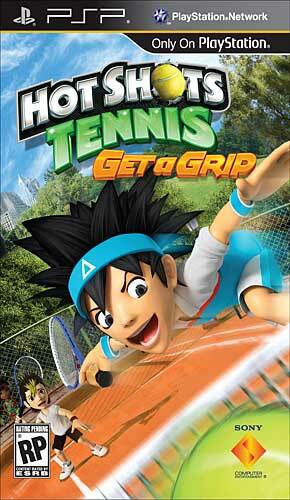 It's a capable golf game all on its own. 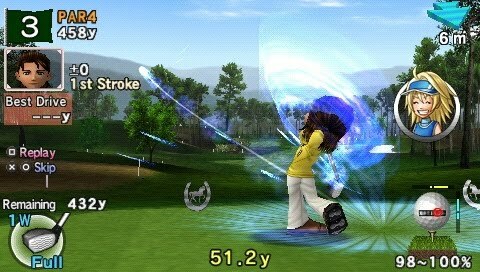 The single-player mode has you competing in tournaments and match play events. As you win you unlock new costume pieces for your characters as well as more challenging trials. While the six courses means you'll grow tired of the game sooner than Open Tee 2, it's still a worthwhile game to pick up for fans of goofy golf who just happen to possess Sony's PlayStation Portable. Tiger tops the list again. Had Tiger Woods PGA Tour 10 not had been so tremendous, we wouldn't be seeing All-Play on this list. It would have been on the original Top Five Golf Games list. Regardless, All-Play usually meant dumbed down for the so-called "casuals". Not so with Tiger Woods. 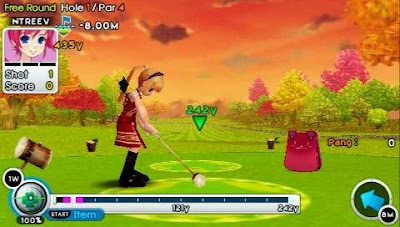 Instead a bevy of party modes were added with fun mini-games, target golf, putting and driving challenges, among others. 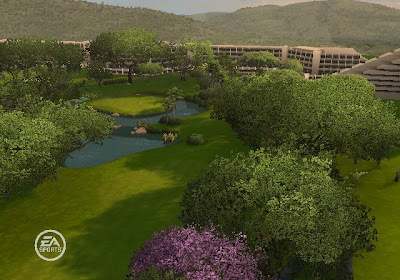 Then you had the twenty-something courses, entertaining commentary, and plenty of holes to sink your balls into. Sounds dirty, no? Nonetheless, Tiger Woods PGA Tour 09 All-Play may be a mouthful, but it tops our list today. 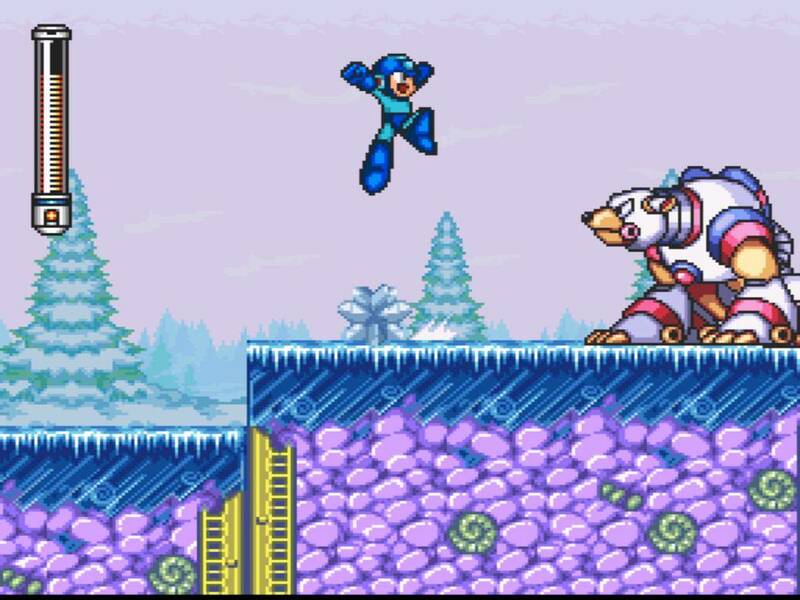 If there's one series I can't get enough of, it would have to be the Mega Man franchise. This is why we're taking a special look at several less-than-loved-the-world-over titles in the series with this installment of Games I Liked, Others Didn't-- Mega Mania Edition! We have five well-known entries in the Mega Man universe that I happen to like. However, there's a sector of [wrong] people who dislike these aforementioned titles. Let's find out why! Jump, jump, slide, slide. What's not to love about these difficult yet fun levels? Mega Man 8 may have had poor Japanese voice acting, but it held a lot of charm with it. It was cool hearing the robot masters speak in battle, and the soundtrack was impressive as well. Of course, the 32-bit visuals didn't do much to detract from the experience either. I enjoyed the variety as well. One level you'd be playing typical Mega Man run and gun action while the next you'd be riding atop Rush, blasting enemies in the sky. 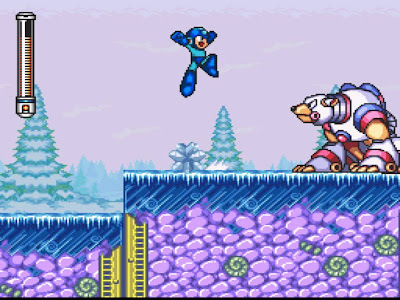 The addition of hidden bolts in the game's levels added longevity-- more so than any Mega Man before it. 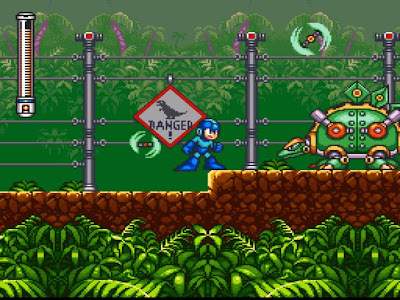 In short, Mega Man 8 is a severely underrated installment to the Mega Man series, and I hope Capcom returns to this style. Or even this style for Dr. Light's sake! The 16-bit visuals were vibrant and colorful, the soundtrack was as infectious as the NES tunes, and game had a lot of fun challenge. Some didn't like how big Mega Man was in comparison to the NES games, but I happened to love the change of pace. There were B-E-A-T letters to collect, secret power-ups for Mega Man to obtain, for the first time ever, a shop where Mega could buy special goods with collected bolts, and some of the most ingenious and fair level design since Mega Man 4. This is just another case of haters gonna hate, it's the sensational Mega Man 7. Now this game I can understand why there's some hatred for it. It was damn difficult to beat! Not only did Mega Man take a lot of damage each hit, but there's the matter with the chip gauge. You see, at the start of each level a gauge would be full, allowing Mega Man to select five chips from a random selection of chips. The problem is that this gauge would then refill so slowly that you'd be waiting minutes for the opportunity to choose new chips. This means that if you got bad chips, you were out of luck until the next time the gauge filled. 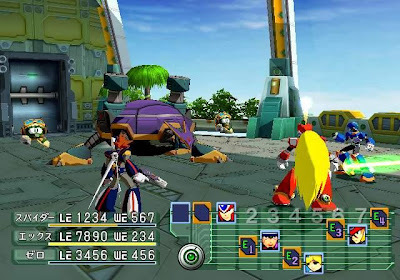 Apart from that (certain items and chips would make the gauge fill faster), the cel-shaded visuals were gorgeous, the soundtrack was catchy, and the game was fun overall. 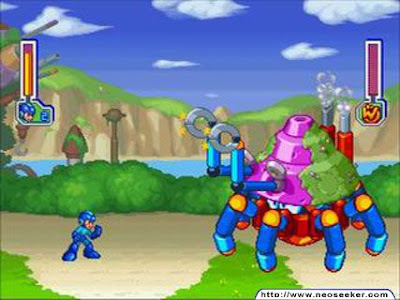 Some think Mega Man, or his future self X, should stay in the realm of action-platforming. 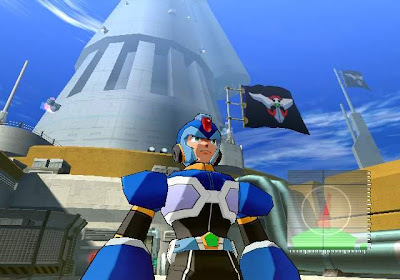 Mega Man X: Command Mission showcases Mega Man X in his first and one and only endeavor into the world of role-playing. The turn-based action was fun if not derivative of other titles, and the story was engaging enough to follow through to the very end. Who didn't like the awesome cast of characters that would join your party? Sure, the game was pretty linear, and it isn't too innovative, but Mega Man X: Command Mission is a competent RPG even without the Mega Man name attached to it. After the abysmal showing that was Mega Man X7, I had much trepidation to try out its sequel. Reading up that it would return X to his 2D roots, I opted to pick the game up, and I'm glad that I did. 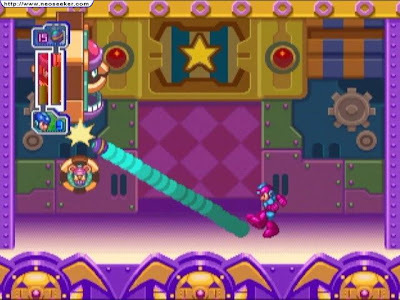 Yes, spikes are thrown around in the game's levels like sugar to children, and there's two dud vehicle levels, but overall Mega Man X8 is a successful game. 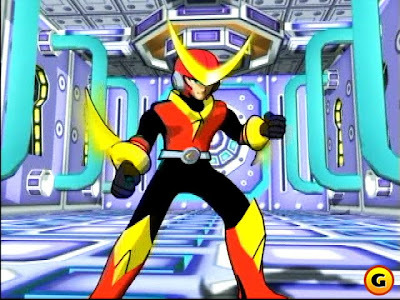 Being able to switch between two heroes added a new dynamic to the game (even though it was present in X7), the 2 1/2D levels were tremendous, the music was a step in the right direction, and the bosses were as challenging as I was expecting. 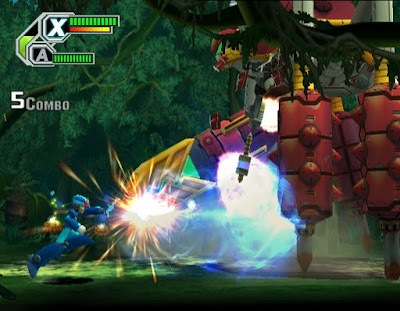 Those with a bad taste in their mouths after X6 and X7 should definitely check out Mega Man X8. That concludes another installment of Games I Liked, Others Didn't. 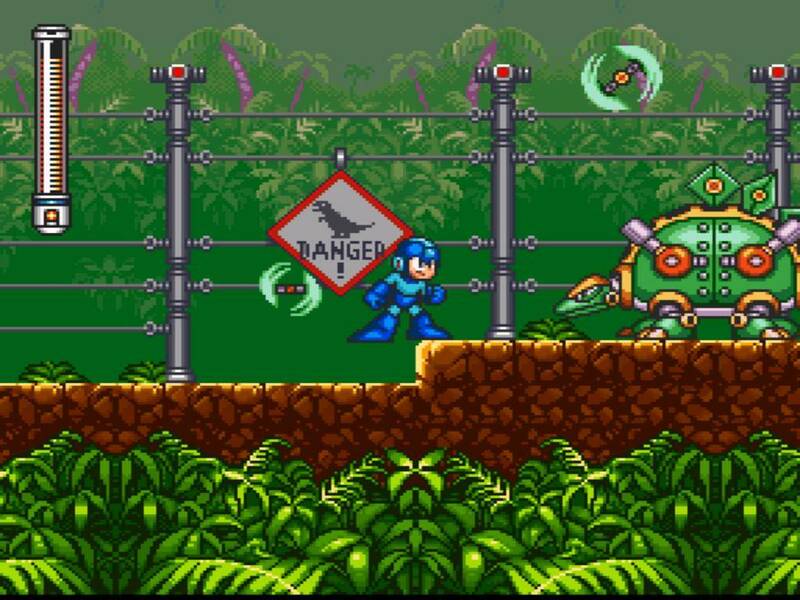 What do you think about these five Mega Man games? Like them? Hate them? Indifferent on them? Let me know in the comments section! March had the release of no less than four big blockbuster titles. What is this-- the holiday season suddenly? I'm eager to see the results, so let's get to them, shall we? March was a big month for the game industry. 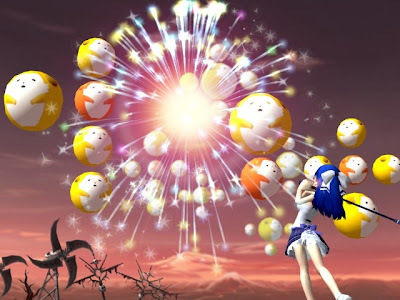 No less than four big blockbuster games came out during the month including the month's winner, God of War III, RPG-king Pokemon SoulSilver and HeartGold, Final Fantasy XIII, and Battlefield: Bad Company 2. God of War III won the month with over one million sales in the U.S. alone, but it wasn't enough to get out of third place in the console war. The Wii won that war this month selling more than half-a-million consoles in March. Old standbys like New Super Mario Bros. Wii and Wii Fit Plus stay around near the bottom half of the list, and MLB 10: The Show swings and hits one out of the park with near 350,000 units in sales. Meanwhile, the brand-new DSi XL seems to have reinvigorated the DS brand greatly despite the announcement of the 3DS. Ultimately, a great month for the industry all-around! Super Mario Galaxy 2 for Wii is my most anticipated game of 2010. More so than ModNation Racers, more so than Metroid: Other M, more so than anything else. Watch these bite-size trailers and discover why I can't wait to enter platforming ecstasy! Ah... the SPC Quickie... Was it good for you? This is where we take games under the microscope for some rapid-fire reviews. Today we're looking at my PSP collection and judging these games in paragraph-sized, bite-size reviews. My PSP collection is pretty big, so this might take awhile, folks. So sit back, relax, and let's get to the Quickies! But first, games are rated from 1-5. 1 being the worst, and 5 being the best. Interested in past editions of SPC Quickies? You know you want more! Check them out below! Time for a huge review for the start of April. No fooling here! 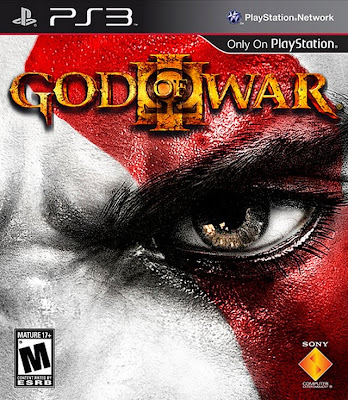 It's the long-anticipated, long-awaited God of War III for the PlayStation 3. Is this game the be-all, end-all for PlayStation 3 owners? Kratos is back to get his hard-sought and hard-fought vengeance on the gods and in particular, the king of gods, Zeus. In the end there will be chaos, and God of War III promises to be tie up the trilogy nice and tightly with bigger battles, bigger bosses, more challenge, and much more to do. Does God of War III deliver on all of these promises? In the original God of War, the previous God of War, Ares, tricked our anti-hero Kratos into murdering his own family in cold-blood. 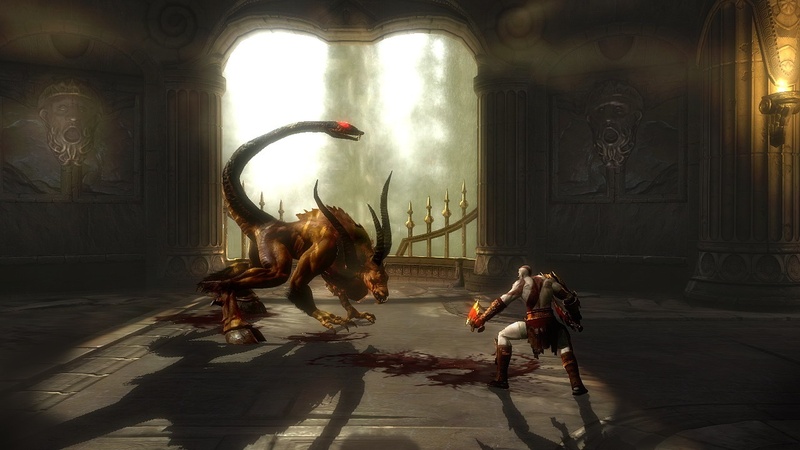 By opening Pandora's Box, Kratos gained the power to kill a god, and he consequently did so, defeating Ares. God of War II had Kratos, the current and future God of War, being killed by Zeus. Coming back from Hades to exact his revenge, God of War III takes place directly where God of War II left off. 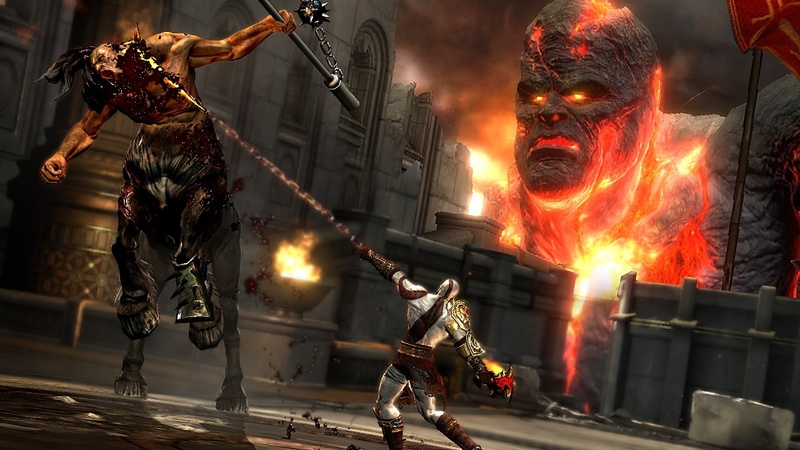 Kratos, with help of the titans, are attempting to scale Mount Olympus to destroy Zeus, king of the gods. Kratos is back, and he's not in a good mood. God of War III has players controlling Kratos through relatively linear paths and passageways, slaying legendary creatures and monsters, on his quest to murder his father, Zeus. That isn't to say the game is totally linear. 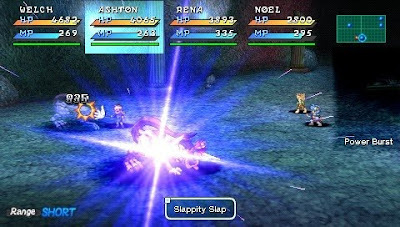 There are side areas with hidden treasures to find containing items boosting Kratos' health, magic, and item power as well as treasures holding red orbs. Not only are these orbs found through opening certain treasure chests, but they're also gathered through defeating enemies. These orbs are used to power up Kratos' weapons and abilities. As they grow in power level, new moves and increased damage are given to Kratos. 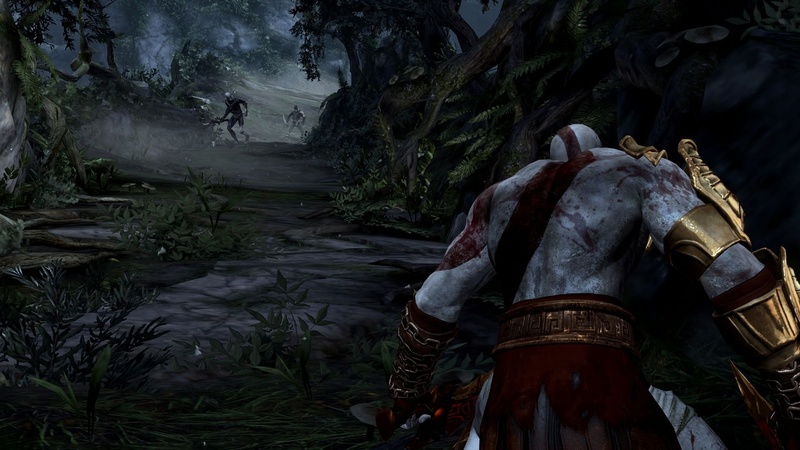 Kratos will need that power for combat, too, as the battles are fierce and visceral. 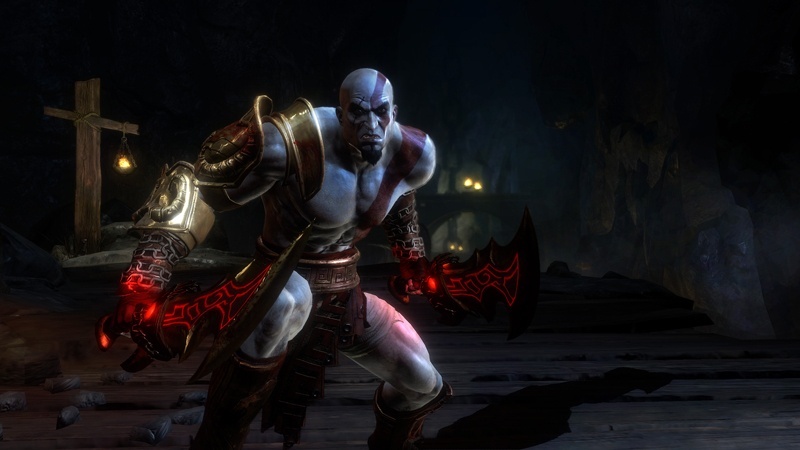 Kratos has a wide selection of moves and attacks in his arsenal including blades, cestus, and whips. One button takes care of weak attacks while another is all about strong attacks. Weak attacks are fast to strike while strong attacks leave Kratos open for damage if he doesn't time them just right. 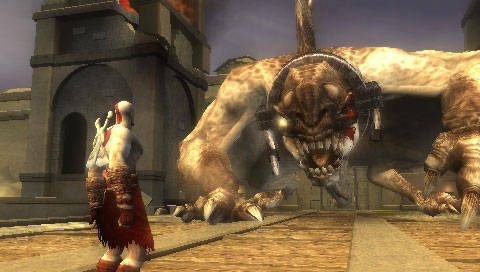 Kratos can also grab enemies with the circle button and unleash his ferocious force onto them. When an enemy is weakened enough, a QTE prompt will appear over their heads. When engaged, the player will have to hit the button or buttons shown on the screen within a time limit in order to decapitate/behead, violently rip to shreds, tear off limbs, etc. 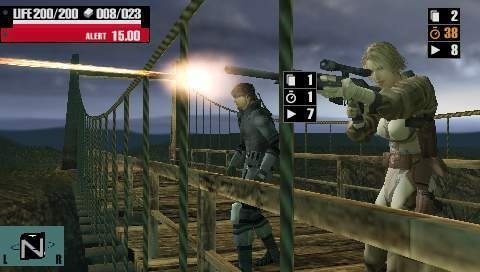 While these QTEs do get the player more active in the combat, I can't help but feel that the game is stuck in 2005 when QTEs were still all the rage. Nowadays, they just come across as tedious to constantly waggle the analog stick, mash a button or two, or hit the proper button that appears on screen or else die a gruesome death. Thankfully, there's plenty of checkpoints to make repeating sections less arduous and annoying. Chimera? I hardly even know her! Combat is a big focus of the God of War series, but that's not all you'll be doing. Kratos will be exploring ancient ruins, palaces, climbing on top of gigantic titans, and even the depths of Hades itself. Sure, there's lots of times where Kratos will enter a room and be trapped inside until he defeats all of the enemies inside, but there's also a lot of puzzles to solve. Moving blocks around is a norm for most action-adventures, and those are definitely there. Regardless, there's some really cool ideas implemented such as a novel perspective puzzle, a puzzle where steps will align themselves when the camera is stuck in a given position. There's also a labyrinth where you can twist the entire maze ninety degrees to solve complicated platforming perils. Apart from the interesting puzzles, there's also a lot of awesome set pieces thrown in for good measure. Battling in a city with a giant titan in the background overlooking your progress to climbing up a gigantic chain to the heavens. Plus, who doesn't love fighting seamlessly atop a gigantic titan's arms, swinging around its enormous body, entering inside its core, and causing all Hades to break loose? The start of the game is just this. It starts with a bang. Kratos is climbing up the backs, arms, and stomachs of the titan Gaia as they struggle to climb to the top of Mount Olympus. Meanwhile, Zeus' last line of opposition, a cavalcade of gods including Poseidon, Helios, and Hades enter the fray, showcasing their patented line of resistance. The first chapter of the game is all about scaling the mountaintop atop Gaia, and taking on Poseidon. Just an excellent scene here. Very cool. Just like God of War II, there is a fair amount of boss battles to participate in... whether you want to or not! Boss encounters are usually multi-part fights that take place in wide, expansive arenas. Each boss has their own specialized attack patterns for Kratos to dodge. Then, when they're wide open to attack, Kratos can get a few hits on them with his blades or other attack weapons. When weakened enough, the real fun begins! A prompt will appear over the boss' head allowing Kratos to enter a QTE session, having the player hit several button and analog prompts to gruesomely take out the foe or at least make them remember why they shouldn't be messing with the God of War! Of course, Kratos isn't alone in his quest of vengeance. Along his journey, he'll acquire new goodies, tools, and weapons that are mapped to the L2 button and assigned to one of the face buttons. There's a bow with fiery arrows, perfect for giving enemies a bad case of sunburn, and it also works on dry batches of bristles, great for burning them to open up new paths. Additionally, there's the head of Helios that can blind enemies as well as illuminate darkened areas. Finally, there's the boots of Hermes that on specially marked walls can allow Kratos to run up them. In addition, Kratos will earn new weapons such as a life-sucking whip and power-punching pair of cesti taken directly from the universe's strongest man which can be easily cycled with the d-pad. Yeah, he's going to do it. God of War III isn't necessarily a long game. The main quest will take anywhere from 8-10 hours to complete. There's multiple difficulties to try out including a Very Hard setting. Simple button mashing for combat won't work here. You need to dodge and block attacks frequently to pass the many trials put before you in this mode. Once the game is beaten, a new Challenge of the Gods opens up. 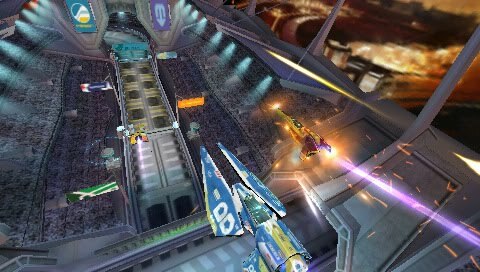 This mode pits players in various themed battles with a set condition for victory such as not getting hit or defeating all of the baddies in the given time limit. Additionally, new costumes are unlocked to use. These are fun to use, but the void the player from getting any trophies. As for the trophies, they can be obtained in one playthrough, but getting 100% should take most players upwards of 20 hours at the very least. God of War III is a technically impressive game. It may just be the most beautiful HD game in existence. It runs without any slowdown, framerate hiccups, or anything of that regard. It runs at a silky smooth framerate. That said, the game isn't without its share of glitches. A few times I somehow fell through the floor and died at certain areas of the game. This issue is far from common, but it is there. Meanwhile, the voice work continues to astound. It's fantastic, and it really has a dramatic feeling to it. The music is also very powerful with crescendos when the action gets particularly heated, and some truly haunting, goosebump-giving pieces of music. Smiling is physically impossible for Kratos. Ultimately, if you didn't enjoy the previous God of War games, God of War III probably won't make you a believer in the franchise. There's not much different from past titles to warrant a purchase. That said, fans of God of War and God of War II will find a lot to love here. Everything is bigger, better, and bolder than before. By the Gods, this game is great, too. 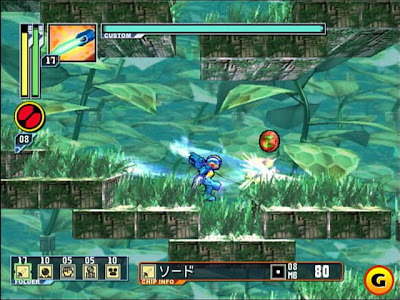 Monster Hunter Tri seems to be the biggest third party game ever on the Wii. It's getting a massive marketing campaign, demos already at GameStop, and plenty of push. While I didn't spend too much time with the demo, I can't really say how the game holds up to previous installments. The minor fact that I've never played previous installments might have something more to do with that. Check out this video from the Nintendo Channel. It comes straight from the developer's mouth. Welcome to an all-new edition of SuperPhillip's Favorite VGMs. Not much of an introduction to speak of this time around. This week we have Final Fantasy Crystal Chronicles: The Crystal Bearers, Goldeneye 007, House of the Dead: Overkill, among others. Let's get to it, shall we? These two poignant songs have the same melody, and they're from the same game, Final Fantasy Crystal Chronicles: The Crystal Bearers. The game wasn't well-received because many critics came in with the wrong idea about the game. It's an adventure, not an RPG. SuperPhillip Central gave the game a satisfying 8.25 out of 10. Not bad for a game that bombed at retail. Dam it all to heck! The first level of Goldeneye 007, the Dam level has James Bond infiltrating the dam facility concluding with a leap of faith with a bungee cord. Goldeneye remains my favorite Bond movie of all time, and Pierce Brosnan is my personal favorite Bond. Goldeneye 007, however, isn't my favorite FPS as that title goes to Perfect Dark. Varla Gunz. What kind of name is Varla f***in' Gunz? This is the catchy pop-like theme song to said female whose life turns to Hell when she comes across one Agent G and one Washington. The House of the Dead: Overkill is my favorite rail-shooter of all time. It's a fantastic game with plenty of fun, surprises, and zombie-blasting action. Kingdom Hearts II was a great game with a confusing as all get out story and enough angst to make for twelve CW television shows. This soft-spoken version of Passion plays at the end of the game, after the final battle has been won. It's a smooth vocal piece at first, and then it ends with a driving bass and rock guitar. Quite nice, wouldn't you say? BGM 10 isn't the real name of this track. It's just what the ripper put it as. 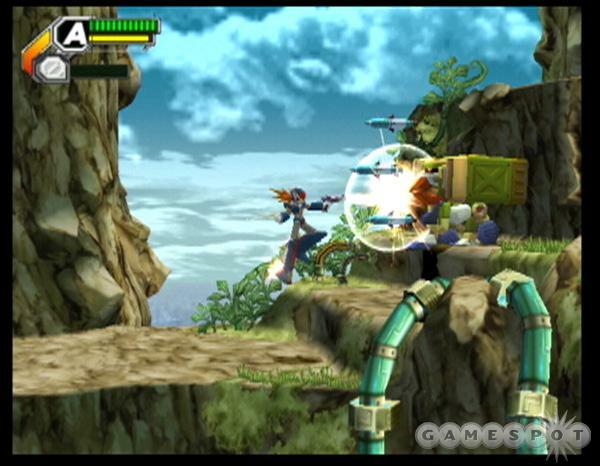 Regardless, The Sky Crawlers: Innocent Aces is a fun flight game with some anime thrown in for good (or bad) measure. Flying and dogfighting hasn't felt this good in such a long time, and a soundtrack to a flight sim game hasn't been this good in such a long time, too. Next week we're getting colorful with Boom Blox, Pokemon Stadium, Billy Hatcher, and more. Until then, find past editions of SuperPhillip's Favorite VGMs by typing that into the search bar on the top left corner of the screen. The PSP isn't dead yet! In fact, it's having a bit of a resurgence in quality. With Metal Gear Solid: Peace Walker, Kingdom Hearts: Birth By Sleep, and a lesser-known title, the newly-named Hot Shots Tennis: Get A Grip. Check out the trailer and see the new boxart in action. There's no release date yet, but the probable latest we'll hear about one is this year's E3 in June. We start off the new week with a look at 3D Dot Game Heroes. 3D Dot Game Heroes is another anticipated game of mine for the month of May. It's an absolutely stacked month with this, Mario, and ModNation all within the same couple weeks. Regardless, 3D Dot Game Heroes is an homage to the classic Zelda franchise, and who doesn't love homages? The fine folks at PSNation have rustled up a ten-minute preview of the game, its features, and some little secrets along the way. Familiarize yourself with this Zelda clone here!